OnePlus recently launched its new flagship the OnePlus 3T at a price that made the OnePlus 3 redundant. The Chinese Manufacturer really knows how to sell products that attracts people. OnePlus 3T is actually the user feedback version of OnePlus 3 which is built to overcome all the issues that users reported in OnePlus 3 like smaller battery. The OnePlus 3 was the best phone OnePlus had made, and one we highly recommended. But it’s time to improvise. 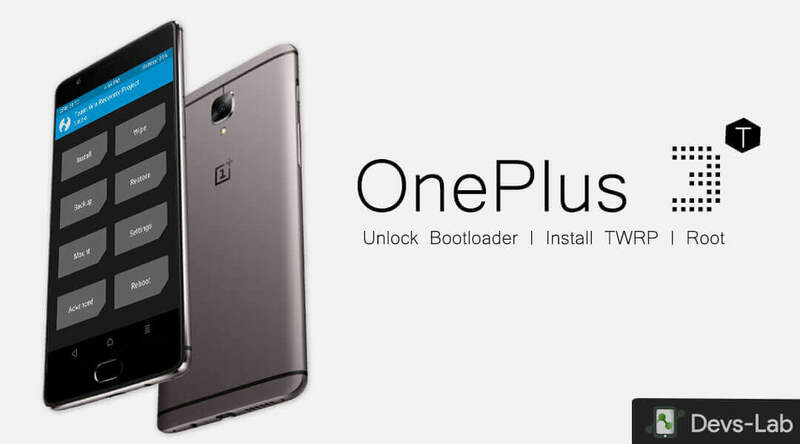 We have already discussed about the procedure of Installing TWRP & Rooting OnePlus 3 which better for OnePlus 3T. If you are confused by anything in this guide, we would highly suggest getting it clarified being before moving on. Ask your question in the comment section and we will get back to you ASAP! 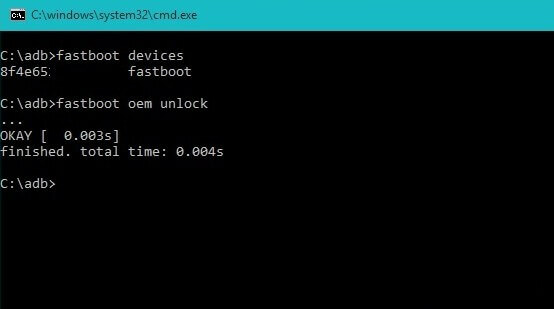 Install Minimal ADB Fastboot Tool. Install ADB Drivers – follow the procedure given in the guide. Enable USB Debugging – Go to Settings > About Phone > Tap on Build number 7 times > Return to Settings > Developer Options > USB Debugging. Backup all your data from your device as unlocking bootloader erases all the data. Charge your device upto 70% to avoid any shutdown during the procedure which might cause some big issue. Enable OEM Unlocking – On your phone go to Settings > Developer options. Then enable the ‘OEM Unlocking’ option. Enable Advanced Reboot – On your phone go to Settings > Developer options. Then enable the ‘Advanced Reboot’ option. Step 2. Connect your device to your PC & launch command.bat file from ADB folder. Step 2. 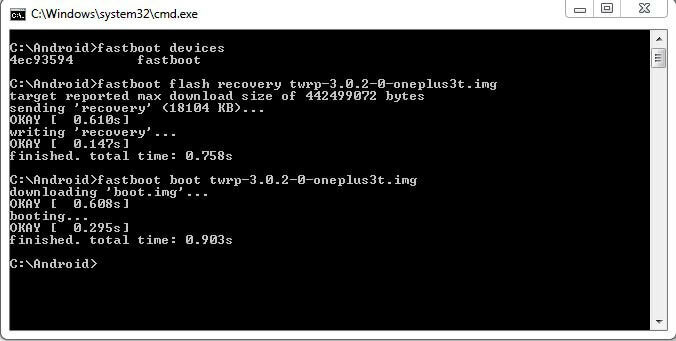 Open Command window & type the below command to flash the TWRP Recovery into your OnePlus 3T. Step 3. Now to boot into Recovery mode, type below command in command window. Step 4. 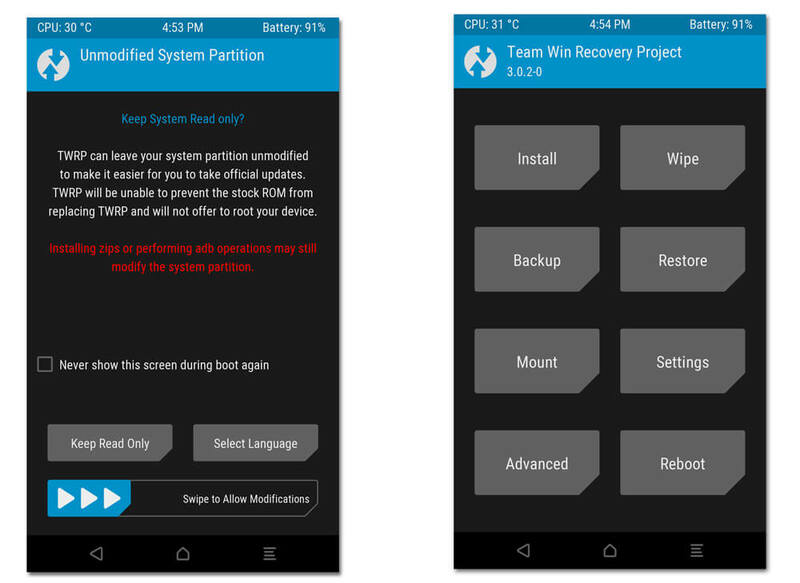 Once your device boots into TWRP Recovery, it will ask to allow system modifications. By swiping right, you will trigger dm-verity, and if you don’t follow the next step you will be unable to boot! If you are going to root your device and follow the rest of these steps, then it is safe to swipe right and enable modifications. Select your preferred Language, Tap “Never show this screen on boot again,” and Swipe allow modification. Step 1. Download SuperSU & latest dm-verity and forced encryption disabler zip. Connect your device to PC & transfer all the downloaded files. Step 4. Now flash the SuperSU zip file from Recovery. Wait for the installation to complete & reboot your device. Keep in mind that the first boot after wiping the phone may take longer than usual, as the phone will need to rebuild the dalvik cache and initialize other first boot and would reboot a few times due to SuperSU Flash. Your phone now has an unlocked bootloader, a custom recovery installed and is rooted.